For those of you who feel that your portfolio needs improvement, then wait no more. I've created a great resource to help you out - How to prepare your architecture portfolio is now available. SUJITH.G.S is an architect and writer, with a passion for travelling, experiencing cultures, studying vernacular architecture as well as contemporary currents, which form the basis for his writing and blogging. He has been recently selected as part of the iGen 2017, the 50 most promising upcoming young architects in India. 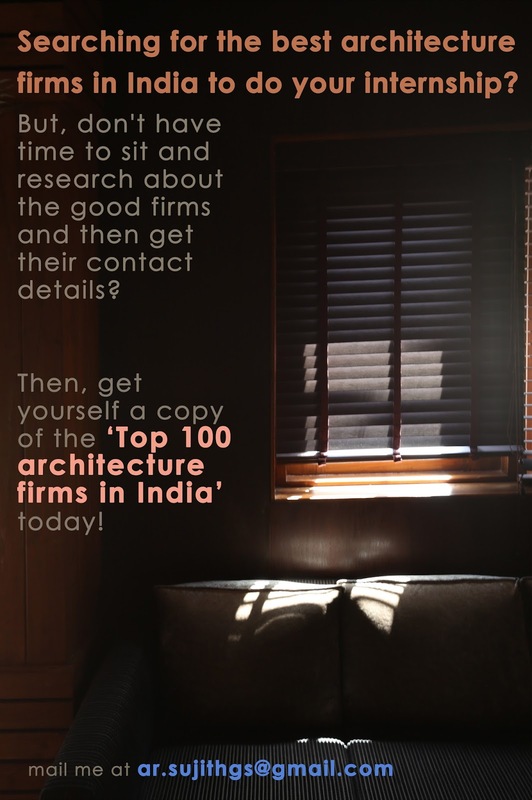 When to start applying for architecture internship in India ? That is always a very interesting question. When is the right time to apply for architecture internships ? The genuine answer to that question is that there is no definite time period for application which will grant you an internship in a good office for certain. In today's age, when there are so many architectural colleges and so many students competing for those few internship opportunities, it becomes highly important to apply early enough so that your portfolio will be reviewed properly. Most of the firms, especially the really good ones, usually finalise their selection of candidates for internships quite early itself and don't leave it till the last moment. The earlier you send your portfolio the better. This is especially so because, this will give the firms a lot more time to go through your portfolio in detail and if it is good then block you or particular seat before considering another applicant. And in my experience, the portfolios send In earlier, which are relatively decent will always be be selected initially itself and the decision will not be reversed. Some of the firms, like Rahul Mehrotra Associates, clearly ask for you to apply at least 4 months prior to your date of joining. That means that you have to start preparing for internships minimum 6 months prior to your joining date. You will have to do your research and identify the firms you want to send your portfolio to. Once you have your list of firms ready, you should immediately send your portfolio. You should ideally have a good number of firms identified to send your portfolio. You cannot decide that this is the firm that I want to work, so I'll send it here only. This is because, most getting selected for internship in your choice of office is very difficult. So always be safe and apply to as many good practices as possible. 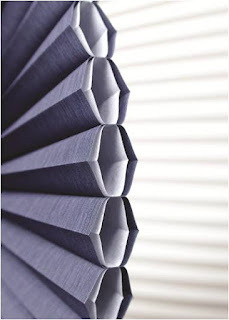 Came across these very interesting honeycomb window shades from Hunter Douglas! Do check it out! An attractive window and the right light can change everything—from your room to your mood. Hunter Douglas, has mastered the art of window dressing by engineering innovative functions into stylish, versatile looks for every window in your house. Hunter Douglas is a leader in light control, energy efficiency, operating systems and motorization, which makes your home smarter, your days easier, and every room that much prettier. Since developing the first lightweight aluminum blind in 1946, Hunter Douglas has led the industry in creating the highest quality, innovative window coverings for homeowners. Our products provide solutions for everyday, practical needs - from privacy to safety to light control - while also satisfying your desires for a stylish furnishing that transforms your home. Exclusive fabrics, energy-saving innovations. Our state-of-the-art, patented design for these attractive shades incorporates three insulating air pockets reducing heat loss at the window by 40%. Most people are unaware of the enormous energy lost through windows and of the energy and cost savings available to them by adding energy-efficient Hunter Douglas window fashions such as Duette Architella honeycomb shades to their windows. By installing Duette Architella shades, a homeowner can reduce heating, cooling, and lighting energy needs in three significant ways. Heat flows through closed windows when there is a temperature difference between the inside and the outside. Heat always flows from warmer to colder, never the other way around. · In the infrared photo, the window covered with a Duette Architella shade (right) is shown to allow much less energy loss than the bare, bright red window (left). · The measure of a product's ability to resist heat flow is called R-Value. The higher the R-value number, the more insulation the product provides and the better it is at reducing heat flow. · In the winter, as much as 40% of the heat that escapes a home flows through the windows. But, a homeowner can reduce up to 30% on their energy bill when they select Duette Architella shades for their home. · If you live in a cold climate requiring significant heating for more than half the year you should select a window covering that adds at least one point of R-value to offset heating costs. · The portion of solar energy that passes through a window to become heat is measured using the SOLAR HEAT GAIN COEFFICIENT (SHGC). SHGC is a decimal fraction between 0 and 1. · The lower a product’s SHGC, the less solar heat it transmits, which can help a home stay cooler in the warm summer months. · Standard double-pane windows have a solar heat gain coefficient (SHGC) of 0.76—meaning 76% of solar heat gain gets into the home. · If you live in a hot climate, or anywhere summers get hot, you need a window covering that effectively reduces solar heat gain. 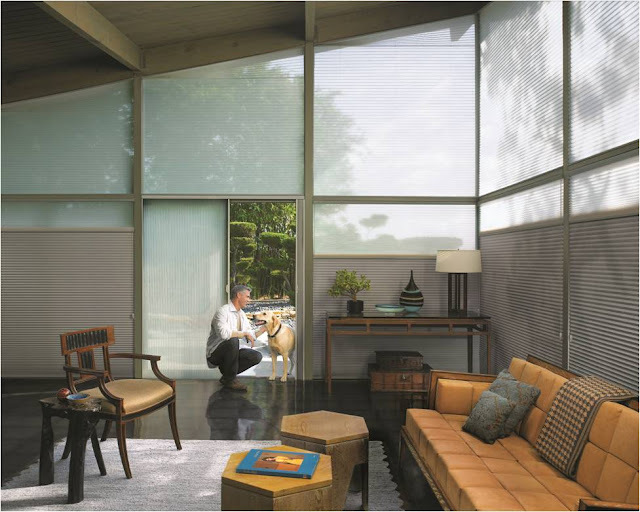 · Duette Architella honeycomb shades can reduce solar heat gain from 76 % (bare glass) down to 17% depending on the fabric chosen. · Using natural light to illuminate home interiors is called DAYLIGHTING and when properly controlled, can be an effective way to reduce electric light use, thus saving energy. 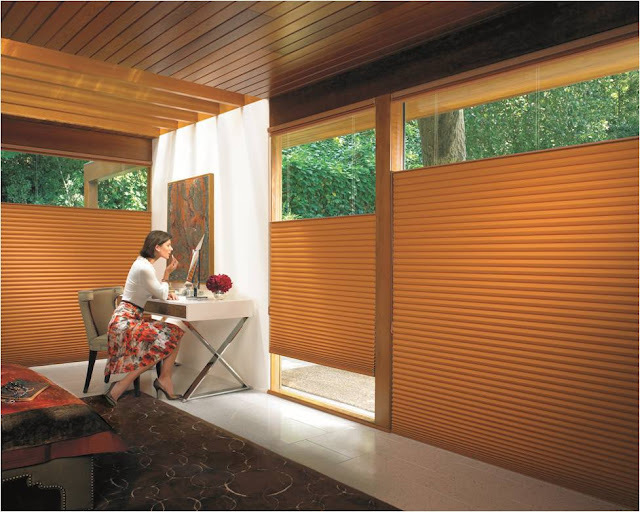 · Duette Architella honeycomb shades have fabric options that filter up to 99% of the harmful UV rays while in the closed position. · The goals of daylighting are to even the intensity of incoming light and bring light deeper into the room. The best way to do this is by diffusing light. 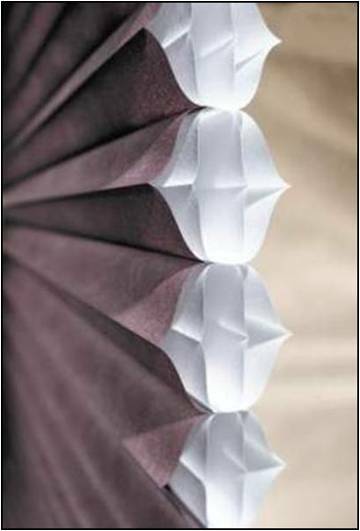 · Duette Duolite™ shades, which combine Duette Architella fabric with a Semi-Sheer or Sheer fabric, will diffuse light into the room plus add visual variety to any window. 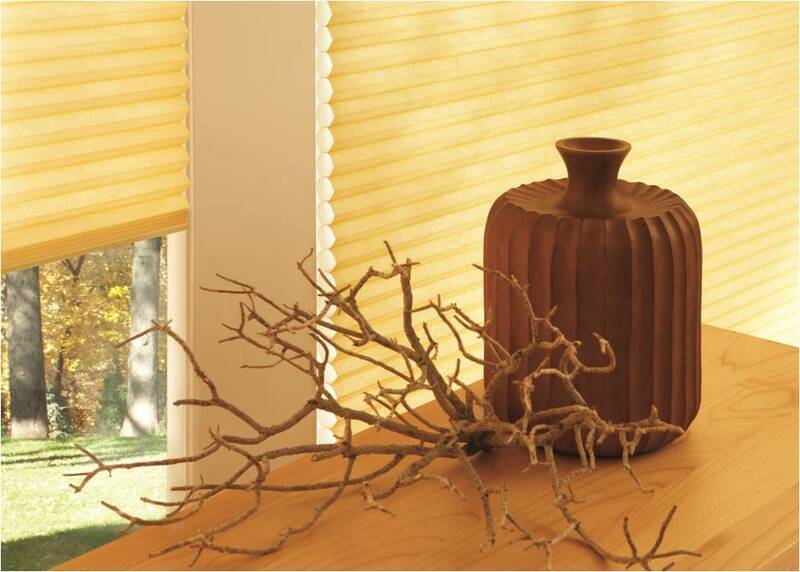 Duette® Architella® honeycomb shades offer luminous colors and crisp, consistent pleats. Lower them for privacy, or raise completely for maximum light and view—they’re beautiful either way. Also consider our Architella Trielle™ Elan® shades. Their five insulating air pockets make it our most energy-efficient design yet.